As part of its efforts to raise public awareness of glaucoma, Santen Pharmaceutical Co., Ltd. (hereinafter “Santen”), based in Osaka, will sponsor glaucoma awareness-raising activities to be conducted around the world during the World Glaucoma Week, from Sunday, March 10, to Saturday, March 16, 2019. Glaucoma is an eye disease that causes damage to the optic nerve, resulting in progressive visual field loss. Although this disease can lead to loss of vision when left untreated, early treatment often allows patients to maintain visual field throughout their lifetime. Therefore, early detection through regular ophthalmic consultation is the desirable starting point when treating glaucoma. The World Glaucoma Association, of which Santen is an Associate Glaucoma Industry Member, defines one week every March as the World Glaucoma Week and hosts various events and awareness-raising activities around the world to encourage people to detect and begin treating glaucoma as early as possible. Santen has also implemented various initiatives to increase public awareness of the importance of early detection and continued treatment of glaucoma. 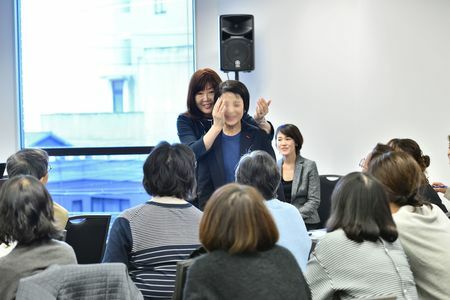 As part of such initiatives, Santen hosted the disease awareness-raising event “Recommendations for Continued Treatment and Care” targeting glaucoma patients in Nagoya, Aichi Prefecture, central Japan, on November 17, 2018. This event included a makeup lesson given by facial therapist Ms. Reiko Kazki (hereafter “Ms. Kazki”), a pioneer in rehabilitation makeup*, and a lecture by glaucoma specialist Dr. Aiko Iwase (Director of Tajimi Iwase Eye Clinic, hereafter “Dr. Iwase”). Although many types of eye drops are available for treating glaucoma, they can sometimes bring about adverse effects, such as hyperpigmentation (abnormal coloring) around the eyes and deepening of the upper eyelid sulcus (sunken eyes). An important challenge of glaucoma treatment is that some patients hesitate to receive continued treatment out of concern about such side effects or stop using eye drops based on their own judgment. This event was held to provide such patients with the opportunity to overcome their feelings about the adverse effects and increase their awareness of the importance of continued treatment. Santen also continues to regard the World Glaucoma Week as a period for employees to learn about glaucoma on their own initiative and impart their learning to their loved ones, including family members and friends. The company will devote further efforts to encouraging all employees, including those working around the world, to deepen their understanding about glaucoma. As a specialized company dedicated to ophthalmology, Santen carries out research, development, marketing and sales of pharmaceuticals, over-the-counter products, and medical devices. Santen is the market leader for prescription ophthalmic pharmaceuticals in Japan and its products now reach patients in over 60 countries. With scientific knowledge and organizational capabilities nurtured over a nearly 130-year history, Santen provides products and services to contribute to the well-being of patients, their loved ones and consequently to society. The company’s Chairman and CEO is Akira Kurokawa. For more information, please visit Santen’s website (www.santen.com). Source: Santen Pharmaceutical Co., Ltd.